Here is a List Of Best Free Age Calculator Software For Windows. These software will help you to calculate your age from Date of Birth. It seems helpful whenever you need to know your exact age. Actually, it is very difficult to calculate one’s age manually. It is a tedious job because of so many factors like leap year, unequal numbers of days in months, etc. All of these age calculator will easily calculate your age in few steps. All of you need is your Date of Birth, current date, or any date up to which you want to calculate your age. All of these age calculator software will help you to find age from your date of birth and display age by Years, Months, or Days. Some age finder will find your age by total years, total months, total days, total hours, total minutes, and total seconds. Some age checker will automatically calculate your age till current date; they don’t require current date to be filled. You can also find difference between any two dates. This type of age calculator software help you to calculate age of a person up to a date of your choice. Some will help you calculate exact difference between two dates inclusion of weekends, holidays, any specific dates, and days. So, these age calculator are not just helpful for age calculation only, but also help you to calculate date differences with versatile features. So, if you want to calculate your age or date differences then go through this article, pick any of your choice. Here, you can also learn how to calculate age and how to calculate date differences. While testing, I found Age Calculator (LIC Free Programs) is an interesting age finder software. I like this software because of the freedom to choose range of dates. It means, you can calculate your age from your date of birth to any date of your choice. It shows your age in Years, months, and days. It also displays your age by total Years, total months, and total days only. You can also check out List of Best Free Scientific Calculators, Best Free Calculators, and Best Free Exchange Rate Calculator Software for Windows. You can also find difference between any two dates. Age Calculator is a free software to calculate age of a person. It requires only Date Of Birth of a person in Days, Month, and Years. It will automatically calculate and display age of that person in Years, Month, and Days. You don’t have to fill current date, it will automatically take current date into account to calculate age of the person. Age Date Diff Calculator is a free Age calculator software. It lets you select date of birth from calendar and displays your age in Years, Months, and Days. It automatically considers current date to calculate age. You can also calculate difference between two dates. Actually, it has two tabs: one is for calculating age and second is for calculating date difference. So, the other tab calculates difference between any two given dates. It requires a start and an end date. Age Calculator.Net is a free year calculator. It helps you to find age of multiple persons at a time. It has multiple tabs to do so. It requires an Initial date and an End date. If you want to calculate age of a person, then you have to fill Date of Birth of that person as Initial Date, whereas current date as the End date. Then it will calculate and display age of that person till current date. It also displays total number of Months and Days left for your next birthday or anniversary. Here you can also calculate difference between any two dates. Age Calculator By WiseVIN is a free and simple age finder software. It is a small software and takes very less space of your PC. It asks for your Date Of Birth information. You have to fill Date, Month, Year, Hour, Minute, and Period. Then it will display your age in Years, Months, Days, Hours, Minutes, and Seconds till current date. You do not have to put current date; it will automatically consider current date to calculate age from your Date of Birth. Date Calculator is a free age checker software to find age of a person. Here, you have to select your Date of Birth and an End date up to which you want to find your age. You can select dates from the calendar available on its main interface. Similarly, you can also calculate date difference between two specific dates. It lets you add or remove weekends in your calculation. This year calculator has options to include or exclude both start date and end date in your age calculation. Years, Months, Weeks, and Days. At the bottom Of this age calculator software, you will find options to jump to +10 years, -10 years, +1 years, and -years from selected dates in calendar. Easycalculation is a free age calculator software. It lets you calculate your age from your Date of Birth. You just have to fill your date of birth and the date up to which you want to calculate your age in required fields. Then it will calculate and show your age in Years, Months, and Days. You can also find age in days only. It lets you know about the number of days left for your next Birthday. This freeware is a complete suite of various mathematical calculator and converters. To use its various tools, you have to make an account, which is free. Then you can download or purchase any tools from Free calculator or Purchase Calculator respectively. Free calculator option contains list of all free mathematical tools. Age calculator can be downloaded from here and you will find all downloaded tools in My calculator option. Note: Although it is a free software, still you need to be connected to internet while using this Age calculator. Date Calculator by Dmbkiwi is a freeware to calculate age of a person. It lets you calculate your age in days only. You have to select a Start Date as your birthday and an End Date as current date. Then this age calculator will display your age in days. Actually it is a software dedicated to calculate difference between two dates. 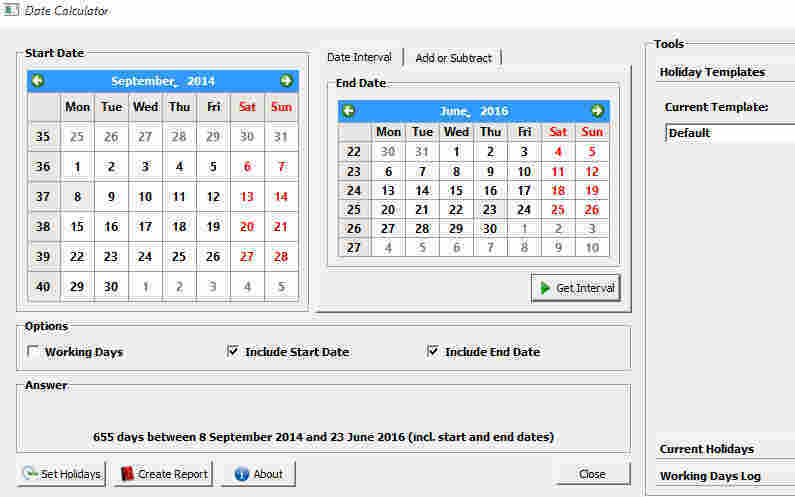 It is specially developed for professionals who want to keep tracking between two dates. It also helps you to calculate dates based on various criteria. You can include start and end date in your calculation. It also lets you exclude weekends and holidays. It can also add and subtracts days for selected interval. It can save holidays, templates, and working days logs. It also prints report as PDF. Farsight FreeCalc is a free age finder software. To calculate your age from Date Of Birth, you have to use Date Calculation Tool through Tools>DateCalculation>Two Dates. Here, you have to select your Date of Birth as Beginning Date and Ending Date is the date up to which you want to calculate your age. After selecting required dates, click on Days Between Dates options to view your age by Total days and Years, Months, and Days. This Age calculator is mainly a calculator to solve mathematical and scientific calculation, but it incorporates many tools for various functions. One of them is DateCalculation, which helps you to determine difference between two dates and it also provides information about a single year, like: Number of Days, Number of Weeks, Number of Months, and about leap year.